We had our first contact with vert.x in 2012 as we tried to use it for our first RaspberryPi project. We did a simple implementation of our JVx connection interface and used the Vertx net implementation to run our applications without application server on a RasPi. Our implementation was based on vert.x 1.2. We didn't use our implementation since that time. We re-used the project in the last weeks because vert.x is still alive and we changed some things in our connection to support streaming protocols. It was a great test case for our changes. First of all, we did an update to vert.x 2.1.5. Our implementation is now up-to-date. We also changed the implementation because it wasn't an optimized solution. We removed our internal buffering and used vert.x core classes. We also created verticles to support the core concept of vert.x. If you're interested, simply check the source code. There are two test cases: TestNetSocketConnection and TestHttpConnection in the test folder. 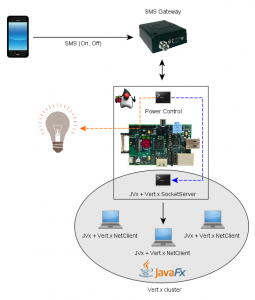 You could use the solution to run a JVx application on an embedded device without a Java application server. But you should know that this project isn't an official project of SIB Visions, and we don't offer support for it. But we try to answer your questions via Forum. 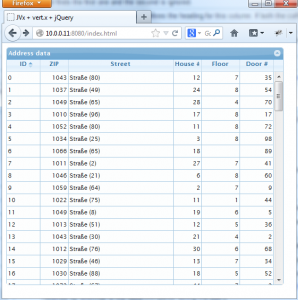 The project is currently located in the JVx repository, but we'll move it to its own repository in next few weeks.